Here on a hillside farm, a hundred feet from the Lincoln Tunnel, a rooster crowed. It was 8:16 a.m., the peak of the Monday morning crush into New York City. Bus brakes squealed. A trucker’s horn boomed out as cars inched down the J-shaped helix and into the tunnel’s mouth. The rooster paused; then it crowed again. Konstantinos Natsis, owner of rooster and farm, was busy curling a tomato plant’s young green vine around a trellis of white plastic twine. When he turned to look at the traffic jam, his gray eyebrows lifted, as if surprised to see the tunnel — this famous, dirty, diesel-soaked symbol of the city — so close to his sunflowers and pumpkins. To be fair, that’s not exactly all he does. Natsis and his wife, Helen, also have spent lots of time, and hundreds of thousands of dollars, suing their neighbors, the township of Weehawken, soil engineers, the J. Fletcher Creamer construction company, police officers, and a bunch of other people for what they allege is a 15-year conspiracy to deny their right to develop the farm into luxury apartments. The effort, they say, has been led by Weehawken's mayor, Richard Turner, to punish the Natsises for supporting Turner’s opponent in the 2002 election. Konstantinos Natsis is a fine farmer. He harvests figs, eggplants and green squash as long and skinny as French baguettes from soil pitched at 45 degrees on a rectangle of rocky land 2 miles from Manhattan. Over the last 15 years he and Helen have proved less adept at land development and lawsuits, however. 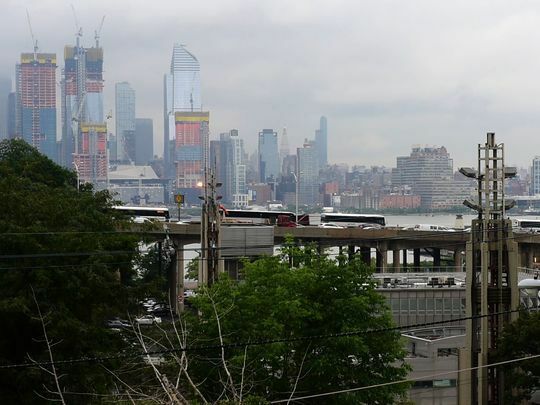 From Weehawken Municipal Court to state and federal court, they have lost case after case. The problem is simple, said Elise DiNardo, the township’s attorney. Weehawken never denied the Natsises permission to build, because the couple never asked for permission in the first place. “You can’t retaliate against anyone who hasn’t applied for anything,” Turner said. 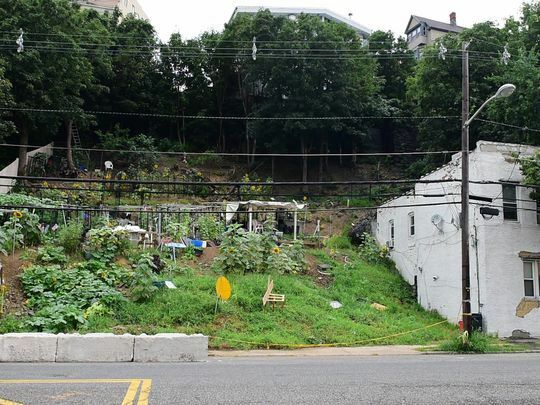 Rather than abide by Weehawken’s laws protecting the basalt rock of the Palisades cliffs, Turner said, Konstantinos Natsis just started digging. Natsis worked with hired laborers to attack the cliff with pickaxes, shovels and sledgehammers, according to photos and court testimony from neighbors and township employees. Natsis admitted in testimony in Superior Court in Hudson County to digging steps into the cliff, and to destroying the retaining wall behind his house with a jackhammer so he could create an emergency exit from his home. These actions violated the law, Superior Court Judge Thomas P. Olivieri ruled in 2012. Natsis’ work undermined the slope, Olivieri said, and threatened to cause a mudslide that could destroy the homes of Natsis’s uphill neighbors. “The defendants in this matter continue to place the public ... at risk,” Olivieri said in his decision. Natsis counters that the erosion was caused not by him, but rather by contractors hired by the township in 2004 to stabilize the cliff. Whichever side is to blame, Natsis’ farm continues to wash away. Mud and rocks have skidded downhill and now cover the sidewalk, and recently the debris spilled into the street. Natsis owes the township $350,000 for damages and cleanup work, DiNardo said, and he continues to accrue fines at the rate of $3,000 per day. 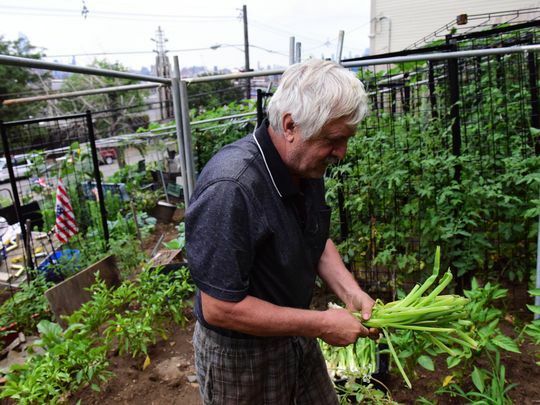 As the mayor and the township attorney mull their next legal move against the couple, and as the Natsises’ latest lawsuit starts its slow crawl through federal court in Newark, Konstantinos Natsis seems content to spend his time puttering around his farm. 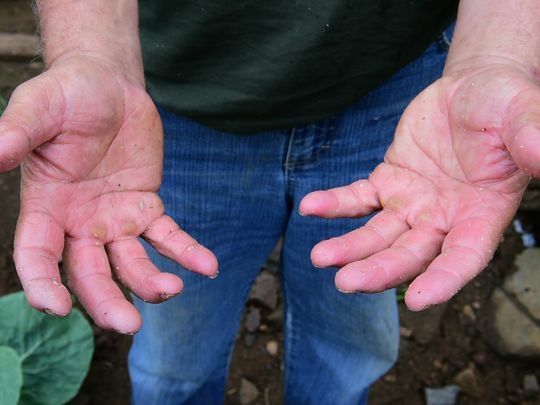 On Monday morning he hit the ground with a pickax and planted onions in the open soil. He climbed down the slope in his muddy Nike sneakers and plucked a green melon from a vine. Every shovel blade he dug into the ground, and every footfall, caused a little mound of dirt to cascade downhill. To slow the fall, Natsis said, he carved into the hillside a series of narrow footpaths that double as terraces. He learned the practice of terrace gardening as a boy in the town of Volos, in central Greece, where his father farmed 4 acres of hilly land and sold the produce at the local market. On Monday morning, a visitor stood on Park Avenue and looked uphill at Natsis’ farm. The place appeared to be in chaos. Flanks of plywood lay across a field of mint. A discarded table teetered on a rock outcrop under a tarp, and a yellow extension cord snaked through the oregano. An aluminum ladder leaned against a tree, a long yellow rope dangled from a post, and a steel pulley hung from a zipline. The scene was disorienting, as if Willy Wonka had decided to quit the chocolate business and start farming zucchini. After a few hours, however, the collection of apparently random junk coalesced into a series of interlocking contraptions. The plywood protects the slope from erosion caused by rain, Natsis said. The ladder, rope and zipline were installed so his grandchildren can have some fun, by either defying gravity or succumbing to its pull. At 9:30 a.m. it started to rain. The rain pooled in the tarp. Natsis prodded it, causing the water to fall onto the teetering table, which funneled it into a plastic garbage can. 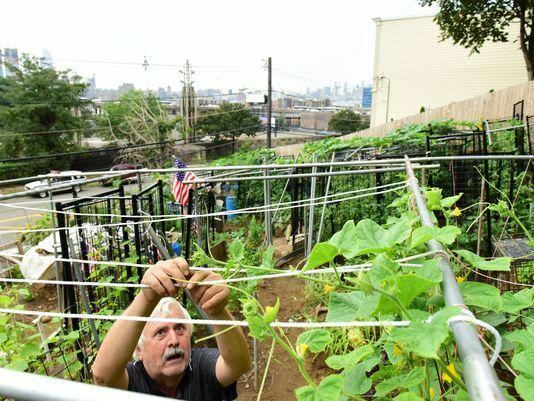 Next he connected the yellow extension cord to an electric pump, which sprayed the water into a hand-dug trench running alongside his tomatoes and cucumbers. Natsis held the green hose over the trench. He looked out at the New York City skyline and the people on buses and in their cars, fighting to get into the famous tunnel. Natsis was content to stand where he stood, on his falling mountain.